I have begun a Symphony on The Creation—first movement Chaos—not the noisy idea but deep very mysterious and weird—sullen—then on this comes ‘the Spirit of God on the waters’, the evolution of Kosmos out of Chaos, then the divine idea of man, just hinted at and not fully complete till it appears in the sixth day movement; ending with ‘Let there be light’—bright trumpets very high up. This movement is sketched, and I am off my head with joy! You won’t perhaps realize the musical idea, but translate it into your own work, and it will be clear as day. When I think of it I seem to see your patient fingers making Kosmos out of the Chaos clay—and the mystery of your art will lead to appreciation and understanding of all. I don’t believe in the ultimate happiness of the man who says one art is enough for a lifetime, for even a lifetime is too little to know one art thoroughly, But everyone can translate into his own tongue the work of others, absorb it till pictures appear as symphonies, and symphonies as sculpture. And some of these days all my work will be forgotten in that of the king who is coming. But still a tiny bit of me will live in his work, just as in my own weak way I have soaked in the others who have gone before, and feeling that if it had not been for them where would I be! Wallace was a deeply thoughtful Christian: his verse-play on the subject of the Passion, The Divine Surrender, was published the year before he started work on the Creation Symphony. Originally intended for a music-drama, Wallace had recast it in spoken form. It achieves a fine intellectual balance between the Jewish, Roman and Christian points of view and, like his music, is the product of a passionate and balanced mind. Regarded in its poetic significance as a Liturgical Hymn, and not as a record of events, the first chapter of the Book of Genesis presents a theme suggestive of symphonic treatment. Since the aeons into which the Work of Creation was divided cannot be interpreted in a strictly literal sense, the music aims at depicting the emotion which the contemplation of the theme in its poetic and symbolical meaning is able to awaken. Adagio — Allegro: ‘In the beginning God created the heaven and the earth. And the earth was without form, and void; and darkness was upon the face of the deep.’ It is these opening words of the Bible which inspire the opening bars of the symphony: a passage of profound mystery and great orchestral daring—double basses divided and solo tuba representing ‘“emptiness and space”, the correct and literal meaning of the Greek word “chaos”’, as Wallace himself describes it. The choice of C sharp minor as the main key is designed to produce a dark, veiled colouring that contains within itself the potential of brilliance in its relative E major—especially when, in Wallace’s days, horns and trumpets could be pitched in E.
The challenging dotted rhythms which introduced the main Allegro, and a process of gradual transformation of the thematic material, might be taken as the latent energy of light: indeed the theme for light, which emerges in the closing moderato, is derived from that of the void. The movement anticipates the triumph of the whole symphony, reaching a climax of cosmic power, before it ends with an ecstatic but calm hymn representing ‘light’, in Wallace’s own words, ‘exemplified by very soft strains, as an influence that comes from above’. It is reminiscent of his first tone poem, The Passing of Beatrice, in which a vision of heavenly love is realized. Andantino: ‘And God made two great lights; the greater light to rule the day, and the lesser light to rule the night: He made the stars also.’ The Andantino starts with an extraordinary evocation of the poised mystery of starlight, using a simultaneous double augmentation of the opening phrase with exquisite orchestral colouring and minimalist purity, nearly a century before its time. The largo introduces the first true melody of the movement, tracing the beautiful and stately progress of the moon. But the symbolic purity of the moon is far from passionless. Again we are reminded of The Passing of Beatrice and the anticipation of spiritual consummation which leads logically to the striding theme of the sun. This is heard against the re-worked texture of the opening section of the movement, and is followed by all three themes in combination. This trinity of light is also symbolic of the Trinity of the Godhead from which it emanates, reaching towards a triumphant fanfare as the sun rises to a radiant zenith to bring the movement to a close. Allegro: ‘And the Spirit of God moved upon the face of the waters. And God said, Let the waters under the heaven be gathered together unto one place, and let the dry land appear.’ The movement is a kind of scherzo starting with a restless figure based on the unresolved interval of the tritone and suggesting the restlessness of the oceans. As it gathers force, a new theme emerges from the brass—‘in the character of a sea song’, as Wallace puts it—and is succeeded by a pastoral theme identified with the earth. After a return of the opening restlessness, the two themes are combined in a closing section of Wagnerian grandeur. Allegro maestoso: ‘So God created man in his own image, in the image of God created He him; male and female created He them.’ A magnificent fanfare heralds the culmination of the symphony—the creation of man on the sixth day. ‘To attach a verbal meaning to each individual phrase is as impossible as is the task of analysing the human being’, declared Wallace. But he describes the movement as mainly triumphal, though drawing attention to ‘phrases which may be considered as symbolizing the ultimate dissolution of the flesh that is as grass’. As a doctor and surgeon Wallace was familiar enough with the dissolution of the flesh, but this movement is primarily symbolic of the creative capacity of humankind—‘male and female created He them’—and the triumph is as much the triumph of love and, specifically, his own and Ottilie’s love, placing himself and her as a kind of Adam and Eve in the newly created Eden of his finale, upon which the second-movement theme of the sun rises in splendour. 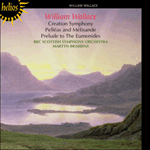 Wallace’s skilful development of his thematic material, and the tautness of the weave of its evolution (not to mention the vividness of the orchestral colours, singly and in combination), would merit pages of analysis. But above all, it is itself a creation born of an unfaltering conviction, which makes of this work a seamless cloth of beauty, originality and power. J’ai débuté une Symphonie sur la Création—premier mouvement, le Chaos—, non l’idée bruyante, mais le tréfonds très mystérieux et surnaturel—menaçant—, puis vient «l’Esprit de Dieu sur les eaux», l’évolution du Kosmos surgi du Chaos, puis l’idée divine de l’homme, juste suggéré et incomplètement abouti jusqu’à son apparition au mouvement du sixième jour; fin sur «Que la lumière soit»—trompettes éclatantes très aiguës. Ce mouvement est esquissé, et j’en suis malade de joie! Tu ne réaliseras peut-être pas l’idée musicale, mais traduis-la dans ta propre œuvre, et ce sera clair comme le jour. Lorsque j’y pense, il me semble voir tes doigts patients faire surgir le Kosmos de l’argile du Chaos—et le mystère de ton art conduira à l’appréciation et à la compréhension de tout. Je ne crois pas au bonheur ultime de l’homme qui dit qu’un art suffit à une vie, car même une vie ne suffit pas à connaître un art en profondeur. Mais chacun peut traduire l’œuvre des autres dans sa propre langue, l’absorber jusqu’à ce que les images se fassent symphonies, et les symphonies sculpture. Et un de ces jours, toute mon œuvre sera oubliée dans celle du roi à venir. Mais un minuscule morceau de moi vivra dans son œuvre, tout comme moi, dans mon fragile cheminement, je me suis pénétré de ceux qui sont partis avant, sentant que si cela n’avait été pour eux, où serais-je! Wallace était un chrétien profondément réfléchi: sa pièce en vers sur le thème de la Passion, The Divine Surrender, fut publiée l’année qui précéda le commencement de la Symphonie de la Création. Originellement conçue pour un drame musical, elle fut refondue sous une forme parlée. Atteignant à un bel équilibre intellectuel entre les points de vue juif, romain et chrétien, elle est, à l’instar de la musique du compositeur, le fruit d’un esprit passionné et équilibré. Appréhendé dans sa signification poétique comme une Hymne liturgique, et non comme un récit d’événements, le premier chapitre de la Genèse présente un thème qui suggère un traitement symphonique. Les ères en lesquelles l’Œuvre de la Création fut divisée ne pouvant être interprétées dans un sens strictement littéral, la musique vise à dépeindre l’émotion que la contemplation du thème, dans son sens poétique et symbolique, peut faire naître. Adagio — Allegro: «Au commencement, Dieu créa les cieux et la terre. Et la terre était informe, et vide; et les ténèbres couvraient l’abîme.» Ces premiers mots de la Bible inspirent les premières mesures de la symphonie: un passage d’un profond mystère et d’une grande hardiesse orchestrale—les contrebasses divisées et le tuba représentant le «vide et l’espace» (sens correct et littéral du mot grec «chaos», comme Wallace le précise lui-même). Le choix de l’ut dièse mineur comme tonalité principale entend produire une couleur sombre, voilée, dotée d’un potentiel de brillant dans son mi majeur relatif—en particulier à l’époque de Wallace, quand cors et trompettes pouvaient être accordés en mi. Les stimulants rythmes pointés introductifs de l’Allegro principal pourraient être considérés, à l’instar d’un processus de transformation graduelle du matériau thématique, comme l’énergie latente de la lumière: le thème de la lumière, qui émerge dans le moderato conclusif, est dérivé de celui du vide. Le mouvement anticipe le triomphe de la symphonie toute entière, atteignant à un apogée de puissance cosmique avant de s’achever sur une hymne extatique mais calme, symbole de la «lumière», «illustrée par des accents très doux, comme une influence qui vient d’en haut», pour reprendre les termes de Wallace. Le tout rappelle le premier poème symphonique du compositeur, The Passing of Beatrice, dans lequel une vision de l’amour céleste est réalisée. Andantino: «Et Dieu fit deux grandes lumières; la plus grande lumière pour présider au jour, et la plus petite lumière pour présider à la nuit; Il fit aussi les étoiles.» L’Andantino débute sur une extraordinaire évocation du mystère paisible de la lumière des étoiles, à l’aide d’une sur-augmentation de la phrase initiale utilisée concomitamment à une exquise couleur orchestrale, doublée d’une pureté minimaliste, presque un siècle avant l’heure. Le largo introduit la première vraie mélodie du mouvement, sur la trace de la belle et majestueuse progression de la lune. Mais la pureté symbolique de la lune est loin d’être sans passion. À nouveau, nous nous rappelons The Passing of Beatrice et l’anticipation du couronnement spirituel, qui conduit logiquement au thème du soleil. Ce thème s’entend contre la texture retravaillée de la section initiale du mouvement, avant d’être suivi par l’ensemble des trois thèmes combinés. Cette trinité de la lumière symbolise également la trinité du Dieu dont elle émane, atteignant à une fanfare triomphante lorsque le soleil s’élève jusqu’à un zénith radieux, pour clore le mouvement. Allegro: «Et l’Esprit de Dieu se tourna vers la sufface des eaux. Et Dieu dit: Que les eaux qui sont sous le ciel se rassemblent en un seul lieu, et que la terre ferme paraisse.» Le mouvement, une sorte de scherzo, débute sur une figure agitée, fondée sur l’intervalle non résolu du triton, et évocatrice de la turbulence des océans. À mesure qu’il gagne en force, un thème nouveau émerge, joué par les cuivres—«dans le style d’une chanson de marin», comme le consigne Wallace—, auquel succède un thème pastoral, identifié à la terre. Passé un retour de l’agitation initiale, les deux thèmes sont combinés dans une section finale d’une grandeur wagnérienne. Allegro maestoso: «Alors Dieu créa l’homme à son image, à l’image de Dieu Il le créa; homme et femme Il les créa.» Une magnifique fanfare annonce l’apogée de la symphonie—la création de l’homme au sixième jour. «Attacher une signification verbale à chaque phrase individuelle est aussi impossible qu’analyser l’être humain», déclara Wallace. Mais il décrit le mouvement comme essentiellement triomphal, tout en attirant l’attention sur «les phrases qui peuvent être considérées comme symbolisant la dissolution ultime de la chair qui est comme l’herbe». En tant que médecin et chirurgien, Wallace connaissait relativement bien la dissolution de la chair, mais ce mouvement symbolise essentiellement la capacité créatrice de l’humanité—«homme et femme Il les créa»—et le triomphe est autant le triomphe de l’amour, en particulier celui d’Ottilie et le sien, couple placé comme une sorte d’Adam et Ève dans l’Éden, nouvellement créé, de son finale, sur lequel le thème du soleil du second mouvement s’élève en splendeur. Le développement habile appliqué par Wallace à son matériau thématique et la tension du tissage de son évolution mériteraient des pages d’analyse (sans parler de l’éclat des couleurs orchestrales, séparément ou en combinaison). Mais il s’agit avant tout d’une création née d’une conviction sans faille, qui fait de cette œuvre un tissu homogène de beauté, d’originalité et de puissance. Ich habe mit einer Sinfonie über die Schöpfung begonnen—erster Satz Chaos—nicht mit der Idee des Lärms, sondern tief, sehr mysteriös und seltsam—düster—dann kommt „der Geist Gottes auf dem Wasser“, die Evolution des Kosmos aus dem Chaos, dann erdenkt Gott den Menschen, nur angedeutet und erst vollkommen, wenn er im Satz des sechsten Tages auftaucht; und am Ende „Es werde Licht“—sehr hohe strahlende Trompeten. Dieser Satz ist eine Skizze, und ich bin außer mir vor Freude! Du magst vielleicht die musikalische Idee nicht begreifen, doch übertrage sie auf Deine eigene Arbeit und sie wird so klar wie der helle Tag. Wenn ich daran denke, glaube ich Deine geduldigen Finger zu sehen, die den Kosmos aus dem Ton des Chaos formen—und das Mysterium Deiner Kunst wird dazu führen, daß Du alles wertschätzt und verstehst. Ich glaube nicht, daß ein Mensch, der sagt, eine Kunst sei genug für die Dauer eines Lebens, letztendlich glücklich wird, denn selbst ein Leben ist zu wenig, um eine Kunst gründlich zu kennen, doch jeder kann die Arbeit anderer in seine eigene Sprache übersetzen, sie aufnehmen, bis Bilder als Sinfonien erscheinen und Sinfonien als Skulpturen. Und eines Tages wird meine Arbeit in der des Königs, der da kommt, vergessen. Aber trotzdem wird ein winzigkleines Stück von mir in seiner Arbeit leben, genau wie ich in meinen eigenen schwachen Wegen andere, die da vor mir waren, aufgesaugt habe, und das Gefühl hatte, daß wenn sie nicht gewesen wären, wo wäre ich dann? Wallace war ein zutiefst gedankenvoller Christ: sein Versspiel zum Thema der Passion, The Divine Surrender („Die göttliche Kapitulation“), wurde ein Jahr, bevor er mit der Arbeit an der Schöpfungssinfonie begann, veröffentlicht. Ursprünglich war es für ein Musikdrama gedacht gewesen, und Wallace hatte es daher in gesprochene Form umgeschrieben. Er erreicht ein feinfühliges intellektuelles Gleichgewicht zwischen jüdischen, römischen und christlichen Standpunkten, und ist, genau wie seine Musik, das Produkt eines leidenschaftlichen und ausgewogenen Geistes. In ihrer dichterischen Bedeutung als liturgische Hymne und nicht als Aufzeichnung von Ereignissen betrachtet, stellt das erste Buch Moses ein Thema dar, das eine sinfonische Behandlung suggeriert. Da die Äonen, in die das Schöpfungswerk geteilt wurde, nicht im rein wörtlichen Sinn ausgelegt werden können, zielt die Musik darauf ab, die Emotionen darzustellen, die die Betrachtung des Themas in seiner dichterischen und symbolischen Bedeutung in der Lage ist zu erwecken. Adagio — Allegro: „Am Anfang schuf Gott Himmel und Erde. Und die Erde war wüst und leer, und es war finster auf der Tiefe.“ Diese Anfangsworte der Bibel sind es, die die Anfangstakte der Sinfonie inspirieren: eine Passage tiefsten Mysteriums und großer orchestralischer Gewagtheit—mit zwei geteilten Bässen und einer Solotuba, die die „Leere und den Raum“ darstellen, die korrekte und wörtliche Bedeutung des griechischen Wortes „Chaos“ wie Wallace es selbst beschreibt. Die Wahl von cis-moll als Haupttonart soll eine dunkle, verschleierte Färbung produzieren, die in sich selbst den potentiellen Glanz ihrer verwandten Tonart E-Dur enthält—ganz besonders, wenn zu Wallaces Zeiten Hörner und Trompeten in E stehen konnten. Die anspruchsvollen punktierten Rhythmen, die das Haupt-Allegro sowie einen Prozeß allmählicher Transformierung des Themenmaterials einleiteten, könnte man als die latente Energie des Lichtes betrachten: in der Tat ist das Lichtthema, das im abschließenden moderato an den Tag tritt, vom Thema der Leere abgeleitet. Der Satz antizipiert den Triumph der gesamten Sinfonie und erreicht einen Höhepunkt der kosmischen Energie, bevor sie mit einer ekstatischen doch ruhigen Hymne endet, die—in Wallaces eigenen Worten—das „Licht“ darstellt, „das von sehr sanften Strahlen als ein von oben kommender Einfluß veranschaulicht wird“. Es erinnert an seine erste Tondichtung, The Passing of Beatrice („Das Hinscheiden der Beatrice“), in der die Vision einer himmlischen Liebe realisiert wird. Andantino: „Und Gott machte zwei große Lichter: ein großes Licht, das den Tag regiere, und ein kleines Licht, das die Nacht regiere, dazu auch die Sterne.“ Das Andantino beginnt mit einer außerordentlichen Heraufbeschwörung des ausgewogenen Mysteriums des Sternenlichts, indem es eine simultane doppelte Vergrößerung der Eröffnungsphrase mit exquisiter Orchesteruntermalung und minimalistischer Reinheit verwendet, beinahe ein Jahrhundert vor seiner Zeit. Das largo bringt die erste echte Melodie des Satzes, die den wunderschönen und würdevollen Gang des Mondes verfolgt. Doch die symbolische Reinheit des Mondes ist keinesfalls ohne Leidenschaft. Wir werden wiederum an The Passing of Beatrice erinnert, und die Erwartung des spirituellen Vollzugs, der logisch zum schreitenden Thema der Sonne führt. Dies hört man vor dem Hintergrund der umgearbeiteten Struktur des Eingangsabschnitts des Satzes, gefolgt von einer Kombination aus allen drei Themen. Diese Dreieinigkeit des Lichtes ist auch symbolisch für die Dreieinigkeit des Gottes, aus dem sie entspringt, und sich in Richtung einer triumphierenden Fanfare bewegt, während die Sonne zu einem strahlenden Zenith aufsteigt, um den Satz zum Abschluß zu bringen. Allegro: „Und der Geist Gottes schwebte auf dem Wasser. Und Gott sprach: Es sammle sich das Wasser unter dem Himmel an besondere Orte, daß man das Trockene sehe.“ Bei diesem Satz handelt es sich um eine Art Scherzo, das mit einer ruhelosen Figur beginnt, die auf dem ungelösten Intervall der übermäßigen Quart basiert und die Ruhelosigkeit der Ozeane andeutet. Mit wachsendem Momento kommt von den Blechbläsern ein neue Thema—„im Charakter eines Seeliedes“, wie Wallace es ausdrückt—und ist gefolgt von einem mit der Erde identifizierten Thema. Nach einer Rückkehr der Ruhelosigkeit am Anfang werden die beiden Themen in einem abschließenden Abschnitt Wagnerischer Größe kombiniert. Allegro maestoso: „Und Gott schuf den Menschen zu seinem Bilde, zum Bilde Gottes schuf er ihn; und schuf sie als Mann und Weib.“ Eine prachtvolle Fanfare kündigt die Kulmination der Sinfonie an—die Schöpfung des Menschen am sechsten Tag. „Jeder einzelnen Phrase eine verbale Bedeutung zu geben, ist ebenso unmöglich wie die Aufgabe, das menschliche Wesen zu analysieren“, erklärte Wallace. Doch er beschreibt den Satz als hauptsächlich triumphal, obgleich er Aufmerksamkeit auf „Phrasen“ lenkt, „die als Symbolisierung des letztendlichen Zerfall des Fleisches, die wie Gras ist, betrachtet werden können“. Als Arzt und Chirurg war Wallace nur allzu gut vertraut mit dem Zerfall des Fleisches, doch dieser Satz ist in erster Linie symbolisch für das Schöpfungspotential der Menschheit—„und schuf sie als Mann und Weib“—und der Triumph ist ebenso der Triumph der Liebe und, ganz besonders, seiner Liebe zwischen ihm selbst und Ottilie, wobei er sich und sie als eine Art Adam und Eva im neu geschaffenen Eden seines Finales plaziert, woraufhin das Sonnenthema des zweiten Satzes in Pracht aufgeht. Wallaces geschickte Entwicklung des Themenmaterials und das straffe Gewebe seiner Entwicklung (ganz zu schweigen von der Lebhaftigkeit der Orchesterfarben, sowohl einzeln als auch in Kombination) würden seitenlange Analysen verdienen. Aber vor allem ist es selbst eine Schöpfung, das Ergebnis einer entschlossenen Überzeugung, die dieses Werk zu einem nahtlosen Gewebe der Schönheit, Originalität und Stärke macht. That Wallace was aware of the numerological significance of the work is clear. The fact that the last two movements are each 293 bars long, and that he kept track of the bar numbers in his score by placing rehearsal numbers (rather than letters) at ten-bar intervals, is in itself telling. But when we examine the significance of the bar numbers in detail, his use of the scheme is inescapable. To understand it a simple diagram of the ‘26’ and ‘800’ values of the alphabet is necessary (see below). Numerologically, the first movement represents a monad—the single cell of the earth before the Spirit of God caused it to divide. The Hebrew words for ‘the earth’ in Genesis have a numerical value of 296—the number of bars in the movement. Wallace wrote that the end of the movement represents the advent of light and it is likely that its appearance at bar 271 is deliberate, for 271 is the reversal of 172, the number for ‘chaos’ and the inherent darkness which light reverses. Bar 172 itself is the fortissimo climax of the central chaos section. The same themes build up again, but this time they climax at bar 222 in a maestoso in which the theme of the last movement is anticipated. The second movement is 258 bars long. This represents the triple Godhead for it is 86 times 3, and 86 is the number for ‘Elohim’—one of the sacred names for God. It also represents the three sources of heavenly light—stars, moon and sun—which are the subject of the movement. However, just as Wallace described the clay which his sculptress wife worked as ‘chaos’, so ‘chaos’ is still present within the Creation, and it is only at bar 172 that the final section integrating the three separate sources of light commences. That 172 is twice 86 can be taken as significant in a Christian context—Father and Son, but without the Holy Spirit which is the active principle of Godhead in the act of Creation, whether in the Spirit of God moving upon the waters, or in the dove of the Holy Spirit impregnating Mary, the mother of the Son of God. In such an interpretation 172 is the Godhead without the Spirit and therefore, in a sense, Chaos. The third and fourth movements can be taken together. The third starts with the name of Elohim in the opening 86 bars of Allegro, but the symbolism in these movements is also personal. Just as the first movement represents a monad (the singleness of the ‘world’), and the second represents the Holy Trinity and a trinity of sources of light, so the last two movements represent the duality of water and earth, and of woman and man, respectively. However, it is not their separateness, but their coming together that is celebrated. Wallace used the Hebrew letter Shin as his signature at the end of each movement of the score. In 1888 he had published words and music of a Carmen Glasguense in honour of Glasgow University, the bold cover design of a student with mortar-board, books and symbolic letter Shin being his own. The student, in doctoral gown, is probably a self-portrait, the letter Shin meaning ‘song’ being like a W for William Wallace, and also representing the eye and having symbolic associations with the six-bar phrases of the music and six-line poetic structure. Six is the number of days of the Creation and is particularly associated with the creation of man. However, 6 x 60 is 360, and this is the value of the letter Shin in the Hebrew ‘plenitude’ alphabet. Wallace applied this value directly to his own situation. His wife’s maiden name was MacLaren, which has a value of 67 in the ‘26’ alphabet. But on her approaching marriage she would change her name to Wallace, using it professionally as well as personally. By removing MacLaren (subtracting 67 from 360) the result is 293—the number of bars in each of the last two movements of the symphony. The symbolism is not merely that of the loss of a name. The name is a maiden name; it symbolizes virginity. The new number represents the two names, the two sexes, each yielding to the other to produce a number symbolizing their union. In the same ‘26’ alphabet, by an extraordinary coincidence which clearly struck Wallace, the names ‘William Wallace’ and ‘Ottilie MacLaren’ themselves add up to the same number—293. We are not done with coincidence, for in the ‘800’ English alphabet ‘William Wallace’ adds up to 1,189 and ‘Ottilie MacLaren’ to 733. Subtracting the one from the other gives 456, and this number is the sum of Adam (46) and Eve (410) in the same ‘800’ alphabet. There is no question that these are coincidences, but equally there is no doubt that Wallace was aware of and made use of them. I am deeply indebted to the generous scholarship of David Crookes in preparing this note. Wallace était, de toute évidence, conscient de la signification numérologique de son œuvre. Le fait que les deux derniers mouvements fassent chacun 293 mesures, et que le compositeur ne perdît jamais de vue les numéros de mesures dans sa partition, plaçant des numéros (plutôt que des lettres) de répétition toutes les dix mesures, est en lui-même parlant. Mais un examen détaillé de la signification des numéros de mesure révèle que Wallace utilisa indéniablement un schéma. Pour le comprendre, un simple diagramme des valeurs «26» et «800» de l’alphabet suffit. Numérologiquement, le premier mouvement représente une monade—l’unique cellule de la terre avant que l’Esprit de Dieu ne la fit se diviser. Dans la Genèse, «la terre» a, en hébreu, la valeur numérique 296—le nombre de mesures du mouvement. Wallace écrivit que la fin du mouvement représente l’avènement de la lumière, et son apparition à la mesure 271 fut probablement délibérée, 271 étant l’inverse de 172, nombre correspondant au mot «chaos», et aux ténèbres inhérentes, que la lumière inverse. La mesure 172 est elle-même l’apogée fortissimo de la section centrale du chaos. Les mêmes thèmes se reconstruisent alors, mais leur apothéose intervient, cette fois, à la mesure 222, dans un maestoso voyant une anticipation du thème du dernier mouvement. Le deuxième mouvement, long de 258 mesures, représente le Dieu triple (258 étant le triple de 86, nombre équivalant à «Élohim», un des noms sacrés de Dieu) et les trois sources de lumière céleste—les étoiles, la lune et le soleil—, sujets du mouvement. Cependant, de même que Wallace décrivait en terme de «chaos» l’argile travaillée par sa femme sculptrice, le «chaos» est toujours présent dans la création, et ce n’est qu’à la mesure 172 que la section, intégrant les trois sources de lumière distinctes, commence. Le fait que 172 soit le double de 86 peut-être considéré comme important dans un contexte chrétien—le Père et le Fils, mais sans l’Esprit Saint, qui est le principe actif de Dieu dans l’acte de création, que ce soit dans l’esprit de Dieu se tournant vers les eaux, ou dans la colombe de l’Esprit Saint imprégant Marie, la mère du Fils de Dieu. Dans une telle interprétation, 172 est le Dieu sans l’Esprit et donc, en un sens, le Chaos. Les troisième et quatrième mouvements peuvent être pris ensemble. Le troisième mouvement débute sur le nom d’Élohim, dans les 86 mesures initiales de l’Allegro, mais le symbolisme de ces mouvements est aussi personnel. Tout comme les deux premiers mouvements représentent respectivement une monade (l’unicité du «monde») et la Sainte Trinité, plus une trinité de sources de lumière, les deux derniers mouvements symbolisent respectivement la dualité de l’eau et de la terre, de la femme et de l’homme. Cependant, ce n’est pas leur séparation, mais leur réunion, qui est célébrée. Wallace utilisa la lettre hébraïque shin comme signature à la fin de chaque mouvement de la partition. En 1888, il avait publié les paroles et la musique d’un Carmen Glasguense en l’honneur de l’université de Glasgow, et réalisé le dessin de couverture, hardi, qui représentait un étudiant arborant un mortier, des livres et la lettre hébraïque shin. L’étudiant, portraituré en toge doctorale, est probablement un autoportrait; la lettre shin, qui signifie «chanson» et a la forme d’un W, pour William Wallace, figure l’œil et présente des associations symboliques avec les phrases musicales de six mesures et la structure poétique de six vers. Six, le nombre de jours de la Création, est particulièrement lié à la création de l’homme. Cependant, 6 x 60 font 360, qui est la valeur de la lettre shin dans l’alphabet hébreu «intégral». Wallace appliqua directement cette valeur à sa propre situation. Le nom de jeune fille de son épouse était MacLaren, soit 67 dans l’alphabet «26». Mais, à l’approche de son mariage, elle prit le nom de Wallace, qu’elle utilisa tant personnellement que professionnellement. Or, en ôtant MacLaren à shin (soit 360 moins 67), nous obtenons 293—le nombre de mesures de chacun des deux derniers mouvements de la symphonie. Le symbolisme n’est pas simplement celui de la perte d’un nom. Ce nom, un nom de jeune fille, symbolise la virginité. Le nouveau nombre représente les deux noms, les deux sexes, chacun cédant à l’autre pour engendrer un nombre symbole de leur union. Dans le même alphabet «26», et par une extraordinaire coïncidence qui frappa manifestement Wallace, les noms «William Wallace» et «Ottilie MacLaren» se montent exactement au même nombre: 293. Nous n’en avons pas fini avec les coïncidences puisque, dans l’alphabet anglais «800», «William Wallace» équivaut à 1189, et «Ottie MacLaren» à 733. Or, 1189 moins 733 égalent 456, somme d’Adam (46) et Ève (410) dans le même alphabet «800». Il est impensable d’y voir de simples coïncidences, et il ne fait aucun doute que Wallace fut conscient de ces correspondances, et qu’il les utilisa. Ma profonde gratitude va à la généreuse érudition de David Crookes pour la préparation de cette note. Daß sich Wallace der numerologischen Bedeutung des Werks bewußt war, ist klar. Die Tatsache, daß die beiden letzten Sätze jeweils 293 Takte lang sind, und daß er die Taktzahlen in seiner Partitur festhielt, indem er Probenziffern (anstelle von Buchstaben) in Abständen von zehn Takten plazierte, sagt an sich schon viel aus. Doch wenn wir die Bedeutung der Taktnummern genau untersuchen, kann einem die Verwendung eines Planes nicht mehr entgehen. Um diesen zu verstehen ist eine einfache Aufstellung der „26“- und „800“-Werte des Alphabets erforderlich. Numerologisch stellt der erste Satz eine Monade dar—die einzige Zelle der Erde, bevor der Geist Gottes ihre Teilung veranlaßte. Das hebräische Wort für „Erde“ in der Schöpfungsgeschichte hat einen numerischen Wert von 296—die Anzahl der Takte im Satz. Wallace schrieb, daß das Ende des Satzes den Beginn des Lichtes darstellte, und es ist wahrscheinlich, daß sein Auftreten bei Takt 271 absichtlich ist, denn 271 ist die Umkehrung von 172, der Zahl für „Chaos“ und die inhärente Dunkelheit, die das Licht umkehrt. Takt 172 selbst ist der Fortissimo-Höhepunkt des mittleren Chaos-Abschnittes. Die gleichen Themen steigern sich noch einmal, doch dieses Mal ist der Höhepunkt bei Takt 222 in einem maestoso, in dem das Thema des letzten Satzes antizipiert wird. Der zweite Satz ist 258 Takte lang. Es stellt den dreieinigen Gott dar, denn es ist 86 x 3, und 86 ist die Zahl für „Elohim“—einen der heiligen Namen Gottes. Er stellt auch die drei Quellen himmlischen Lichtes dar—Sterne, Mond und Sonne—die der Gegenstand des Satzes sind. Wie jedoch Wallace den Ton beschreibt, den seine Gattin, die Bildhauerin, bearbeitet, als „Chaos“, so ist das „Chaos“ immer noch in der Schöpfung vorhanden, und erst bei Takt 172 beginnt der letzte Abschnitte, der die drei separaten Lichtquellen integriert. Daß 172 zweimal 86 ist kann man in einem christlichen Kontext als bedeutungsvoll einstufen—Vater und Sohn, jedoch ohne den heiligen Geist, der bei der Schöpfung der aktive Teil des dreieinigen Gottes ist, sei es im Geist Gottes, der sich über das Wasser bewegt oder die Taube des Heiligen Geistes, die Maria, die Mutter des Sohnes Gottes, schwängerte. In einer derartigen Interpretation ist 172 der dreieinige Gott ohne den Geist und daher gewissermaßen Chaos. Den dritten und den vierten Satz kann man zusammen betrachten. Der dritte beginnt mit dem Namen Elohim in den ersten 86 Takten des Allegro, doch der Symbolismus dieser Sätze ist auch persönlich. Ebenso wie der erste Satz eine Monade darstellt (die Singularität der „Welt“), und der zweite die Heilige Dreifaltigkeit darstellt und eine Dreieinigkeit der Lichtquellen, stellen die letzten beiden Sätze jeweils die Dualität von Wasser und Erde und von Mann und Frau dar. Es ist jedoch nicht ihre Eigenständigkeit, sondern ihr Zusammenkommen, das hier gefeiert wird. Wallace verwendete den hebräischen Buchstaben Schin als Signatur am Ende jeden Satzes der Partitur. 1888 hatte er den Text und die Noten einer Carmen Glasguense zu Ehren der Universität Glasgow veröffentlicht, wobei die kühne Einbandgestaltung mit einem Studenten mit Doktorhut, Büchern und dem symbolischen hebräischen Buchstaben Schin von ihm selbst stammt. Beim Studenten in Doktorrobe handelt es sich wahrscheinlich um ein Selbstportrait, wobei der hebräische Buchstabe Schin „song“ („Lied“) bedeutet und auch wie ein W für William Wallace aussieht. Außerdem stellt es das Auge dar und hat symbolische Assoziationen mit den sechstaktigen Phrasen der Musik und der sechszeiligen Struktur der Gedichte. Sechs Tage dauerte die Schöpfung, und die Zahl sechs wird insbesondere mit der Schöpfung des Menschen verbunden. 6 x 60 ist jedoch 360, und dies ist der Wert des Buchstaben Schin im hebräischen Alphabet. Wallace wandte diesen Wert direkt auf seine eigene Situation an. Der Mädchenname seiner Frau war MacLaren, das einen Wert von 67 im „26“-Alphabet hat. Doch mit ihrer bevorstehenden Heirat würde sie ihren Namen auf Wallace ändern und ihn sowohl beruflich als auch privat führen. Wenn man MacLaren entfernt (indem man 67 von 360 abzieht), ist das Ergebnis 293, die Anzahl der Takte in jedem der beiden Sätze der Sinfonie. Der Symbolismus besteht nicht im Verlust eines Namens. Der Name ist ein Mädchenname; er symbolisiert Jungfräulichkeit. Die neue Zahl verkörpert die beiden Namen, die beiden Geschlechter, die einander nachgeben, um eine Zahl zu produzieren, die ihre Vereinigung symbolisiert. Im gleichen „26“-Alphabet ergeben durch einen außerordentlichen Zufall, den Wallace ganz offensichtlich bemerkte, die Namen „William Wallace“ und „Ottilie MacLaren“ selbst die gleiche Zahl—293. Und es kommen noch mehr Zufälle, den im englischen „800“-Alphabet ergibt William Wallace 1.189 und Ottilie MacLaren 733. Wenn man die Werte voneinander abzieht ist das Ergebnis 456, und diese Zahl wiederum ist die Summe von Adam (46) und Eva (410) im gleichen „800“-Alphabet. Es ist keine Frage, daß dies Zufälle sind, doch ebenso herrscht kein Zweifel, daß sich Wallace ihrer bewußt war und sie nutzte. Bei der Erstellung dieses Textes bin ich David Crookes zutiefst verbunden, der mit so großzügig mit seinem Wissen geholfen hat.